Photography is a powerful teaching tool. 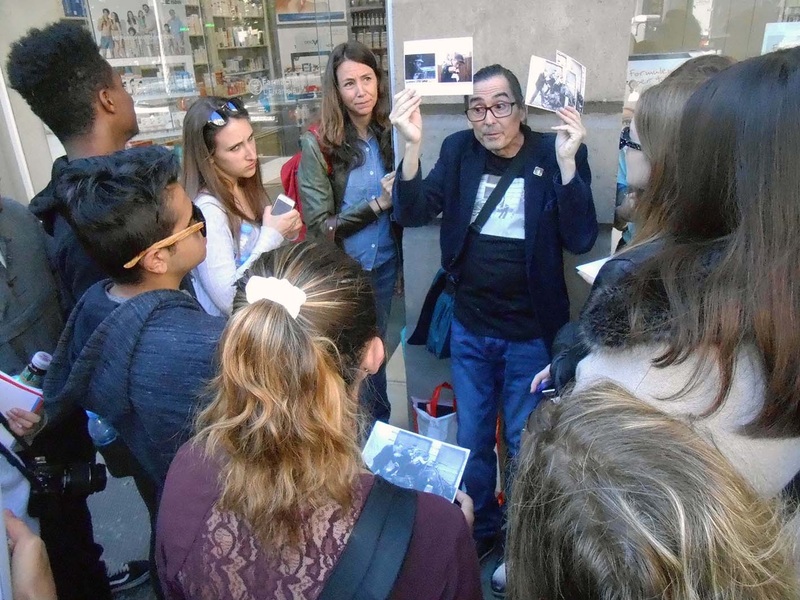 Last April, a group of American students and I met Ricard Martínez in front of a pharmacy on Barcelona’s Carrer de Diputació to follow the steps that Agustí Centelles, one of the most important photographers of the Spanish Civil War, had taken on July 19, 1936, the first day of the conflict. Martínez is founder of Arqueología del Punt de Vista (Point-of-View Archeology), an organization that tries to bring the past and the present together through “re-photography.” Martínez and his team superimpose old historic photographs on present realities in order to cultivate a dialogue between the past and the present. 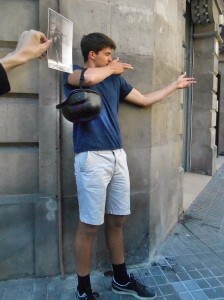 Sometimes this involves placing life-sized cutouts of Spanish Civil War photographs in the very same place that the actions occurred. Other times it refers to aligning a photograph of a historic image in the same place the picture was taken, and taking a new photograph. Martinez is not just an re-photography artist, but also a historian. His work with Agustí Centelles’ photographs has helped establish much of Centelles’ path and creative development on that eventful July 19th. By studying the light in the photographs, for example, Martínez has been able to deduce the times, route, and thought process of the man who took some of the most iconic images of this epic day in Barcelona, when militias retook their city after an attempted military coup. In contrast with photographers like Robert Capa, Gerda Taro and David Seymour, who often cut and separated their negatives from the first months of the war, Centelles’ complete rolls of negatives are intact. By looking at his negatives, we can essentially follow the photographer, minute by minute. That morning in April we retraced Centelles’ path on July 19th, discovering how the 30-year-old Catalan would come to take one of the most iconic shots of the beginning of the Civil War, an image of militias shooting from behind dead horses, which would be displayed on the cover of Newsweek magazine. Centelles was one of the first Spanish journalists to use a Leica camera—he bought one in 1934 for 900 pesetas. He was also one of the only photojournalists in Barcelona without a motorbike or a car. And yet by 1936, the young working-class man had become one of the leading freelance photojournalists in Barcelona, regularly publishing in La Vanguardia, La Humanitat, Última hora, and La noche. In 1937, he served as a photographer at the Aragón battlefront, and in 1938 worked for the SIM (Servicios de Investigación Militar). He fled his country for France in 1939. Famous for his meticulous documentation and organization of his photographs and negatives, as well as those of his friends, Centelles carried more than 4,000 negatives to France in a suitcase when he fled. He guarded this suitcase carefully, using it as a pillow during his stay at the Bram concentration camp in France. This suitcase has become the symbol of his legacy, which he recuperated after Francisco Franco’s death. Using the famous image of the militiamen shooting from behind dead horses, Martinez guided my students through a process of discovery. (This wasn’t easy for a generation of millennials unfamiliar with the basics of analog photography; some didn’t know what a negative was.) By comparing the iconic photograph with others that were taken the same day and observing the placement of various objects (a helmet, a hat, dead horses), and even re-enacting the moment depicted, they concluded that the Newsweek cover image was staged. As the students were practicing their own form of re-photography Martínez encouraged them to ask fundamental questions. Is a photograph a piece of art or a historical proof of an event? What role did photography play in 1936, just eleven years after the Leica camera had been invented? How is its role different today, in an age of image oversaturation? To reflect on these questions on the very same streets where a violent and pivotal conflict occurred was a somber and powerful experience. I visited Barcelona with my family in December 2016. As a lifelong VALB and ALBA supporter lacking an in depth knowledge of the Spanish Civil War I knew of Barcelona’s important place in the history of the Republic but wanted an opportunity to learn more. We were fortunate to find Ricard and APV and to join his tour – Fighting Gazes in Barcelona. The tour provided important insights and knowledge about the histories of the war, photojournalism, and of Barcelona itself. Ricard took us to photographed sights across the city – showed photos and explained the history of the site, the photograph and the photographer. Joining Ricard’s tour was unquestionably the high point of our trip. Anyone interested in history of the Republic and the war, of photojournalism or the evolution of Barcelona itself will benefit from a tour with Ricard if you visit Barcelona. Hello – this is my second attempt to submit a comment. I visited Barcelona with my family in December 2016 and was lucky enough to find Ricard Martinez and attend his “fighting gazes” tour. As a life long supporter of VALB and ALBA I was aware of the important place of Barcelona in SCW history, but woefully lacking in detailed information. Ricard’s tour shed important light on events of the war, ways in which the church collaborated with the fascists, and the special role of refugee photographers in bringing the images of the war to the world. Walking through Barcelona with Ricard we learned not only of the important events in that city, but also of how modern photojournalism was born in the Spanish Civil War. Our tour with Ricard was the high point of our trip. Anyone with an interest in this history will benefit greatly from joining a tour with Ricard.